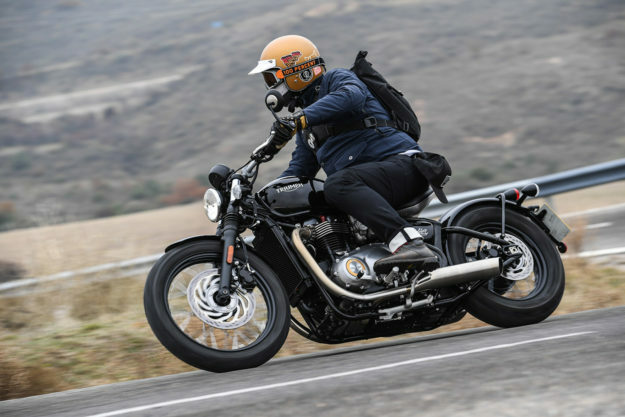 First Ride: Does the Triumph Bobber live up to the hype? 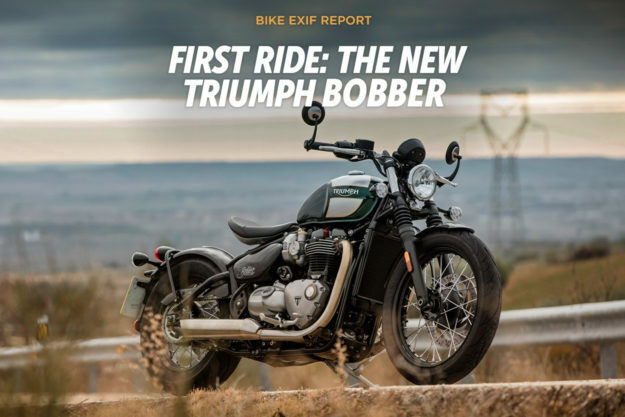 Our early report on the launch of the new Triumph Bonneville Bobber in London generated more hits than any other article on Bike EXIF in 2016—and sparked some pretty heated debate. 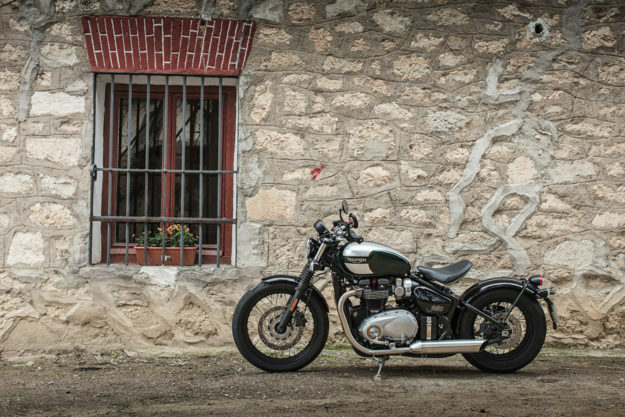 Up to that point, Triumph’s new ‘modern classics’ had been getting high praise at every turn… but was the Bobber a giant mistake? Could the new T120 platform really be stretched that far? How can a factory possibly build a bobber? Would it just be a pretty bike to ogle in the garage? We headed to Spain to find out. Purists will tell you that a true bobber needs to be a custom machine—preferably vintage—stripped of all non-essentials, hard-tailed and hot-rodded. And they’re not entirely wrong. After all, that’s what the first bobbers were, back in the 40s: single-seat, purpose-built machines that were light, quick in a straight line—and a little sketchy to ride. But this isn’t the 40s, and not everyone has the time, skill or cash flow to build a puritan bobber. Most people just want a motorcycle that starts every time, rides well and looks damn good doing it. 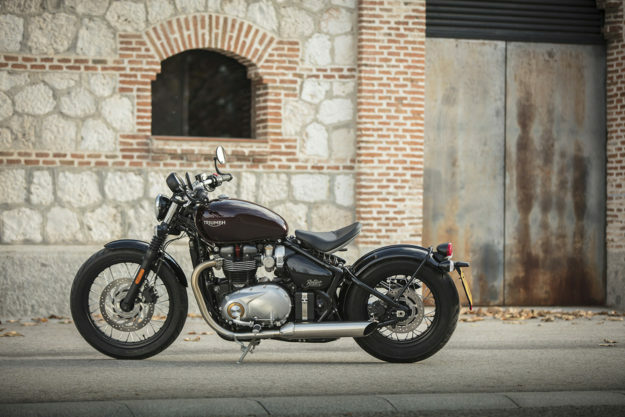 And that is—pretty much—the Triumph Bonneville Bobber. 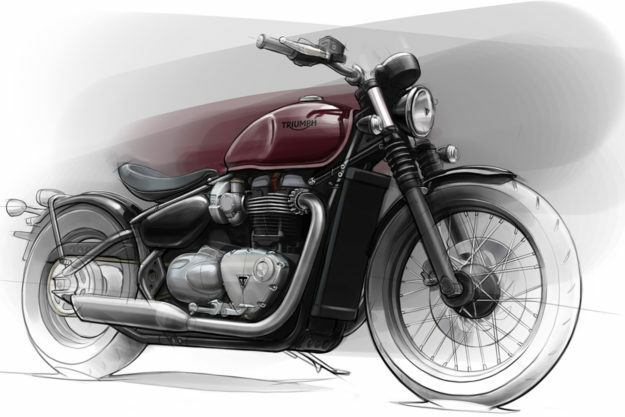 Design Development on the Bobber started three years ago, with a very specific set of goals. 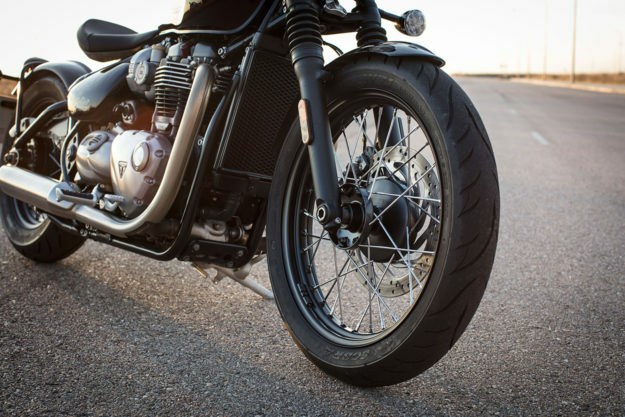 The bike had to have the T120’s DNA, top-shelf finishes, a more exciting power delivery and exhaust tone, and the right ergonomics and ride feel. It also needed that all-important, minimalist bobber vibe, and had to be ripe for customization. 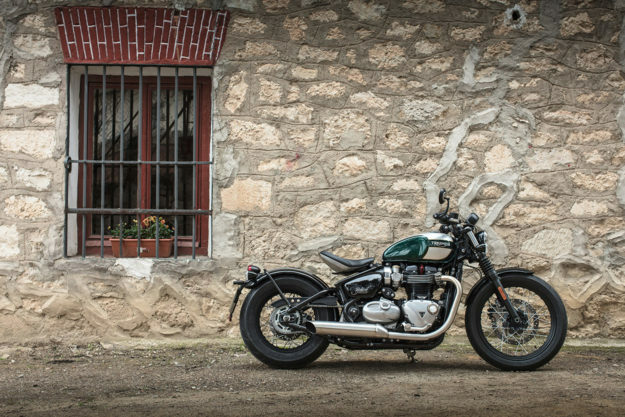 Has Triumph pulled it off? Yes, spectacularly. 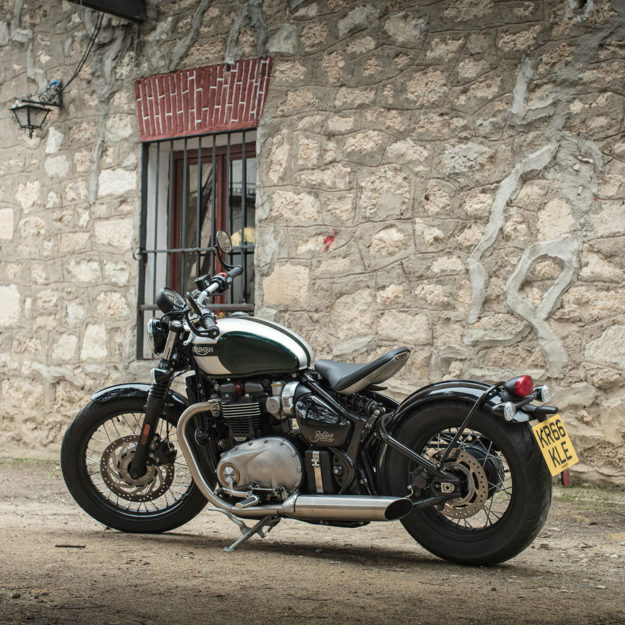 Parked, the Bobber is a visual treat—from any angle—and you’re bound to kill a significant amount of time just taking it all in. The stance is low and lean, with one of the cleanest ‘fake’ hardtail rear ends out there. The ‘cage’ style swing-arm is a thing of beauty, hooked up to a single shock via a beautifully machined linkage. You’ll only see it if you hunch down and look really, really closely. The shock itself is tucked away between dual air boxes, hidden behind side covers. The wheels are a 16” at the back and a 19” up front, both wrapped in specially made Avon Cobra rubber. There are ribbed steel fenders at both ends too, with a throwback looped fender strut on the rear. Up top is a cantilevered solo seat, molded on a brushed aluminum plate, and capped off at the back with a stylish brass Triumph badge. 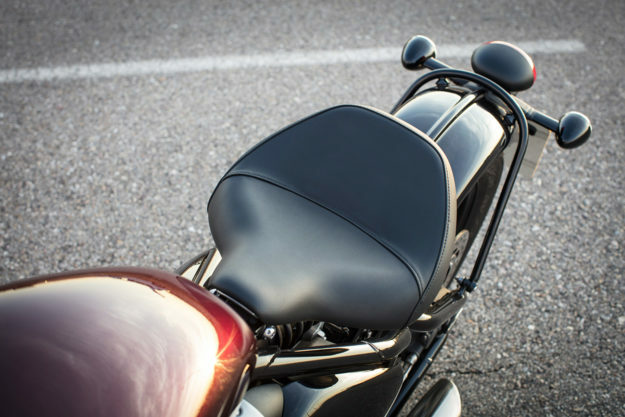 The seat can slide between two positions: up and forward for roadster-biased ergonomics, and back and down for a more laid back, cruiser feel. Slightly forward-mounted foot controls, and a curved, chunky 1” drag bar round out the control package. 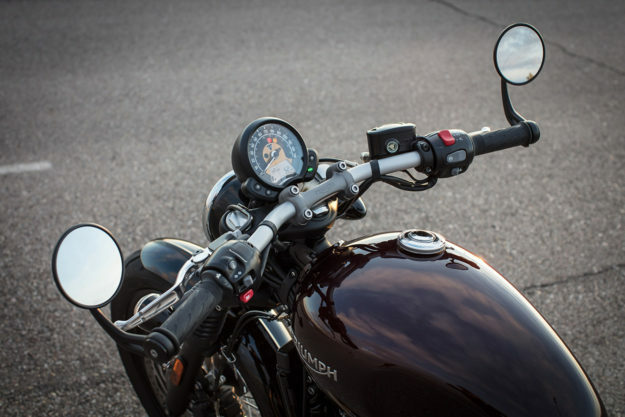 The tank is a similar shape to the T120’s, but smaller (2.4 gallons). And the ignition’s been moved to the right side of the bike. And no, there’s no passenger seat option. We asked Triumph why: They said it was a one-track-minded bike, which allowed them to engineer every detail to work together in harmony. You also get wire-spoked wheels, fork gaiters and a new side cover and sprocket cover, with a removable cap. The clocks, switches, taillight and turn signal are chunky—because OEM. But the headlight is surprisingly compact, and the standard-issue bar end mirrors are a nice touch. The speedo is good to look at, and a decent size. It uses its real estate wisely, displaying a fuel gauge and gear position indicator as well as your velocity. You can also cycle between various bits of info, including fuel range. You can adjust its angle via a little quick release lever, which is a neat feature if you want it perfectly in your line of sight—or just want a different style. Most importantly, the detailing on the Bobber is absolutely sublime. 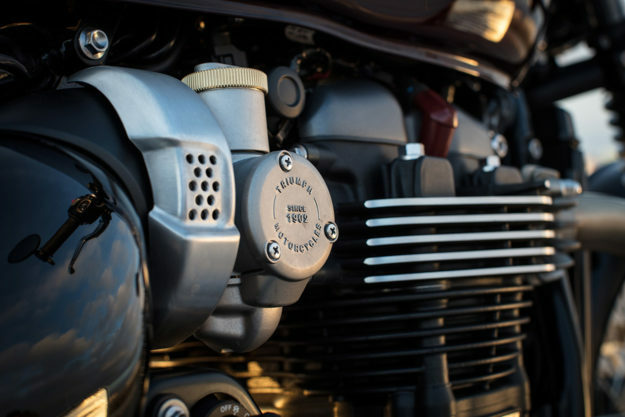 We love the battery box with its stainless steel strap, and the brushed engine covers and their bronze badges. Nothing has gone untouched. Even the faux carbs—a detail I normally dislike—are irresistible, with bronze tops and weathered casings. In fact, the whole bike is loaded with heritage touches that belie just how modern a machine it is. Engine and vital stats The engine and six-speed gearbox come straight from the T120. 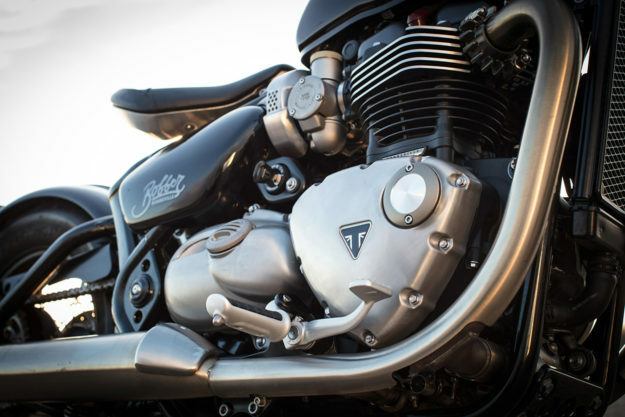 So we’ve got Triumph’s new ‘high torque’ 1200cc mill, complete with liquid cooling and a 270-degree firing interval. 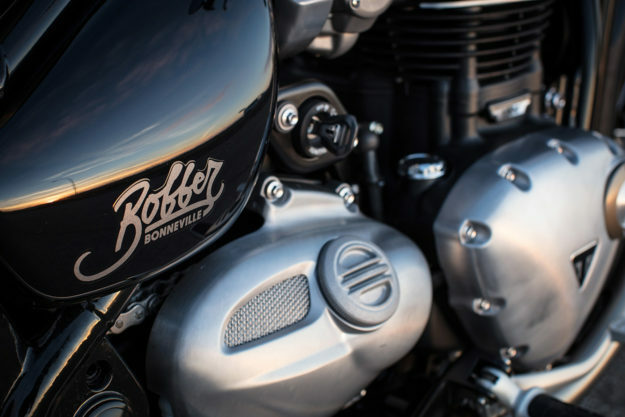 Except the Bobber has a unique intake and exhaust system, and a different engine tune—so it makes its numbers lower: 106 Nm at 4,000 rpm, and 77 horsepower at 6,1000 rpm. All told, it’s a ten percent horsepower and torque gain at 4,500 rpm over the T120. This pretty serious grunt is delivered via a ride-by-wire throttle, with two switchable riding modes: ‘Rain’ and ‘Road.’ Neither cut the bike’s overall power; they simply deliver it differently. ABS and traction control are standard (the latter is apparently switchable, but I didn’t see a button anywhere). But what really impresses is the Tetris-style wizardry that hides the modern tech completely out of sight. The Bobber’s packing all of the baggage associated with Euro 4 compliance and an immobilizer system—but you’d never guess to look it at. 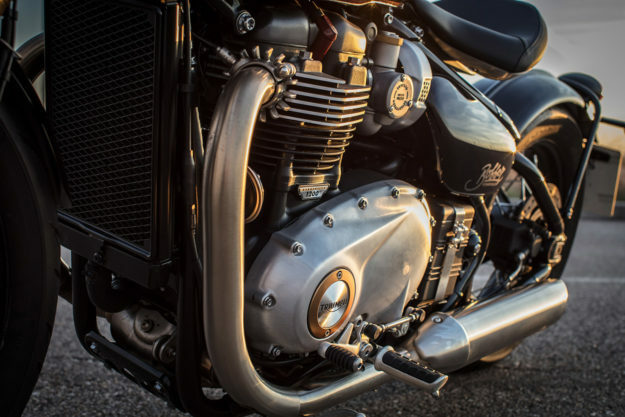 Even the twin stainless steel exhausts maintain that classic Triumph straight-line feel. But they’re actually dual-walled units that divert gasses through a catalytic converter, tucked out of view under the engine. Ergonomics Before getting on the Bobber, I suspected it would be one of those bikes that look cool in photos, but feel crap in the real world. I was wrong. Even for a 250lbs, six-foot-tall, biltong-eating South African like myself, the Bobber is surprisingly comfortable. The foot pegs are far enough forward to be comfortable, but not so far that you lose control. They don’t get in the way when your feet are on the ground. And the sturdy, wide 1” drag bars have just enough bend to stop you feeling over-extended. The seat works fine too. It locks you in, but it’s contoured and padded well—and stays compliant for longer than you’d think. I tried both adjustable positions, but found the up-and-forward setting to be far superior—it gives you more control. For me, the lower position just feels too stretched out. Once you’re tucked in, you also realize just how compact the Bobber really is. I was expecting it to be rather porky, but it feels a lot like, well, a bobber. (Triumph list the dry weight as 503lbs).